My all time favorite jelly on toast is an American classic, the Concord grape. The Concord grape was developed in Concord, MA by Ephraim Wales Bull. The original vine still grows in his original home. I even like the commercially produced, sample size, mini glass jar grape jellies at indistinct hotel breakfast bars. You can just tell it's Concord by its signature deep magenta color. 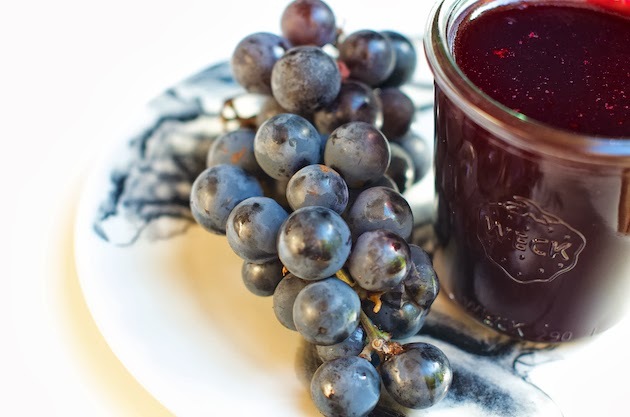 Homemade Concord grape jelly is even more tantalizing in flavor and color than commercial brands. It's not only tastier when home-made, but also healthier, without all the preservatives, artificial flavors and colors and added pectin. 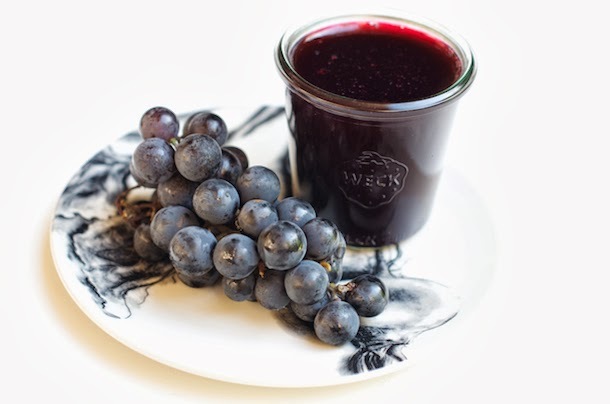 There are all sorts of complicated methods to make this prized Concord grape jelly. My method here is super simple. It achieves the exact desired result without all the labor intensive fuss. No prior peeling of the skin or seeding needed. Just crushing the grapes a tad with a potato masher and running the juice through a sieve. I usually add 1-2 tablespoon lemon to my jellies and jams but I am happy I resisted the urge to do so here. The Concord grapes have rich depth of flavor, a muskiness of sorts, that all it needs is sugar. Grapes are low in pectin fruit but no added pectin was necessary here. After up to 20 minutes of cooking on low bubble, the sides of the pot will have a coating of a thin translucent layer of congealed jelly which is a sign that the jelly is ready. The consistency of the jelly will still be liquid-like when poured into the canning jars but no worries. Let it come completely to room temperature in the jars. It will still wobble and flutter considerably at room temperature. Put a lid on the canning jars and refrigerate overnight. The next morning, the Concord grape jelly, completely chilled, will have the perfect jelly consistency. Traditionally the rule of thumb on ratios is 1 cup sugar to 1lb fruit. I like my desserts, jams and jellies not as sweet so I reduced the sugar to 1 1/2 cups of sugar to albs Concord grapes for the jelly and added only 2 tablespoons of sugar into the alb halved grapes for the tart. The batch of Concord grapes I got was super sweet. You will have to gauge how sweet the grapes you get are and take into account your own personal taste. If you have a particularly sweet tooth you might wish to go up to 2 cups sugar for the jelly and 4 tablespoons sugar for the halved grapes. 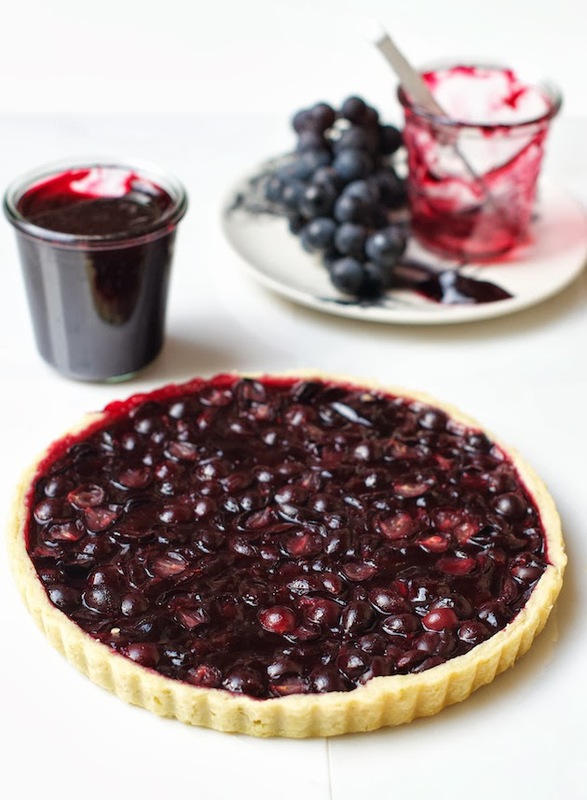 I decided to bake a Concord Jelly and grapes tart as a seasonal sweet. 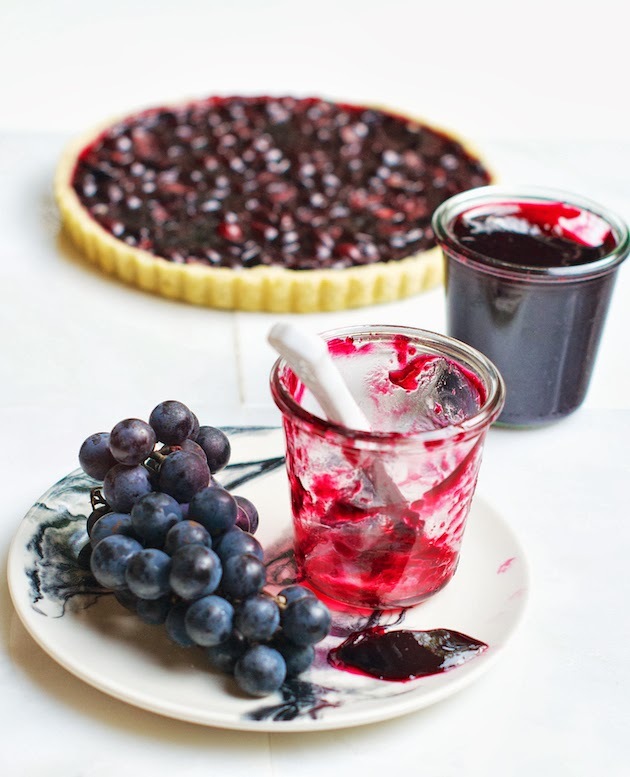 The salty pie dough perfectly compliments the jelly and sweet Concord grapes . I thought of adding fennel seeds or fennel pollen to the pie dough but decided to keep the flavors pure and let the Concord grape shine. I filled the pie dough with a combination of Concord grape jelly and 1lb of halved and seeded Concord grapes. The seeding of the Concord grapes for the tart are labor intensive. You can use seedless grapes instead if you are short on time. A note on the pie dough: I was hoping to find The Pie Gourmet's pie crust recipe online. I think their pies and crust are the best I have ever had in my lifetime. Honestly, I'll think so till the end of times. I have written about it in my 'Last Minute Thanksgiving…' post back in 2009. Unfortunately they keep their recipes hush hush. Who could blame them?! BTW they deliver nation-wide. I had to switch to plan B and used Serious Eats recipe. I drizzled the flour with water throughout the process, and not at the end as the recipe instructed. I have baked pate sucree tart shells with pastry cream fillings topped with fruit many times in the past, but I don't have much experience with pies and pie crusts. I turned to my friends Lora, Cake Duchess and Jane, The Heritage Cook who have more experience in the pie baking department. Thank you both for the pie discussion. You can easily double the jelly batch and use this canning method to preserve the jelly up to a year. If not canning, it will keep refrigerated up to a month. Great hostess gifts for the holidays if you will bear to part with the jellies. You can have the Concord grape jelly on toast for breakfast. Make jelly pies, tarts and crostatas and serve it on a cheese platter. Great little surprise after Concord Grape season is long gone. Further interesting reading material about grape antioxidants and such: 'Deep Purple", a Washington Post article from 2004. Rinse grapes on the vine and let drain through a sieve for a few minutes. Pull the grapes off the vine into a medium non-reactive sauce pan. Crush the grapes gently, approximately 10 times, with a potato masher. Bring the grapes to a boil on high heat and immediately reduce to a low/medium bubble. Cook for seven minutes while stirring once or twice to make sure no grapes get stuck to the bottom of the pan or burn. Turn off the heat and run the cooked grapes through a sieve into another sauce pan or heat resistant large bowl or another non-reactive medium sauce pan. Work with a heat resistant rubber spatula or a wooden spoon, pressing the cooked grapes through the sieve until only the skin and seeds remain. It will yield 2 cups of juice. Add the strained juice right back into the sauce pan if strained into a bowl, add the sugar, stir to mix and bring to a boil. Turn down heat immediately after the grape juice boils and keep on a low/medium bubble for up to 20 minutes* while checking every few minutes that the juice is not sticking to the bottom of the pan and burning. Do not mix constantly. Let it bubble with minimal interruption. Cook for up to 20 minutes* until you will see the liquid starting to congeal into a clear thin layer at the side of the pan. The jelly will still be be liquid-like but it's a sign to pour it into the glass jars. Let it cool completely uncovered at room temperature before putting a lid on and refrigerating. This jam can be kept in the refrigerator up to a month if not canning. Canning instructions can be found on National Center for Home Food Preservation's website. 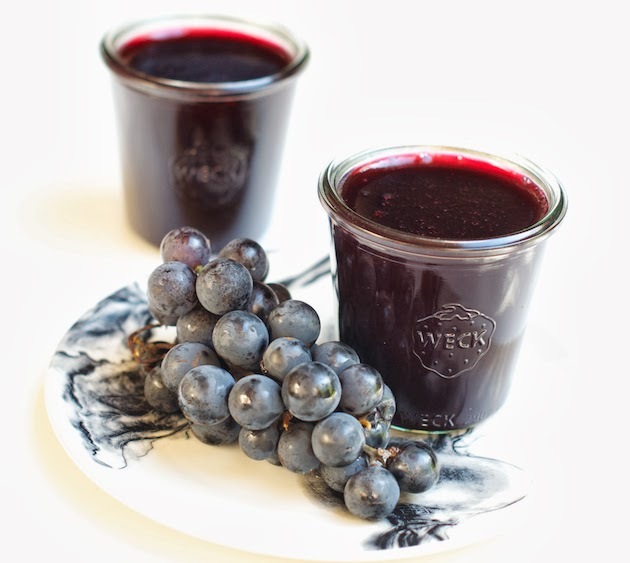 Take the grape jelly out of the refrigerator and set on the counter. Halve and seed the grapes with a paring knife. Pre-heat oven to 350F. On a lightly flour-dusted surface, roll out the pie dough with a rolling pin, to a 12inch circle. Transfer the rolled out dough into a 9-10inch removable bottom tart pan. Lightly press to the sides and trim the excess dough from the top with a knife. 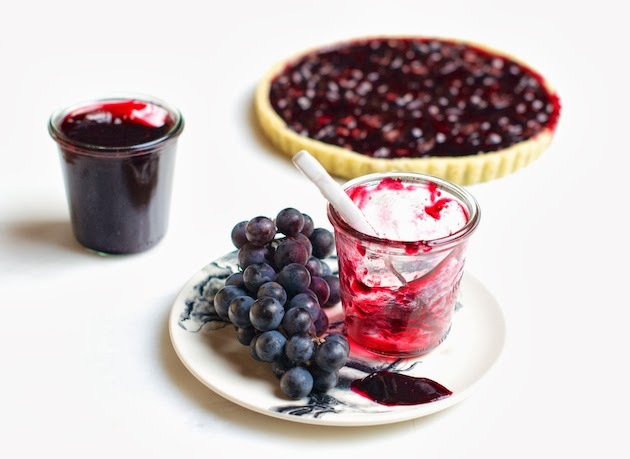 Spread the Concord jelly evenly at the bottom of the pie crust and sprinkle the grapes on top of the jelly. Bake* on the middle rack of the oven for 30 minutes. Let cool on a rack. Chill before serving. Cooking time will vary depending on the size and type of pot you are using. The larger the surface the quicker it will cook and congeal. The smaller it will be gentler simmer and will cook for the full 20 minutes. 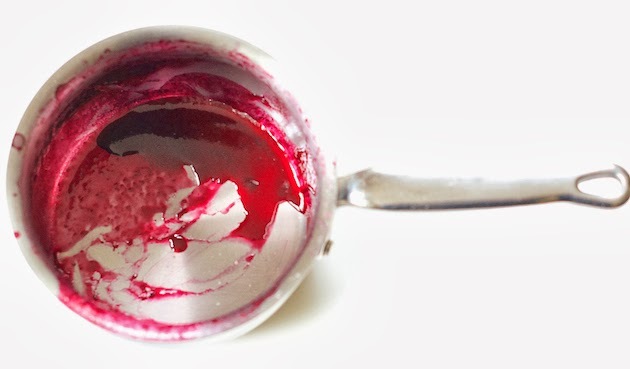 If cooking vigorously the consistency will suffer and won't be delicate jelly-like but firmer. You might wish to place a cookie sheet on the bottom rack of the oven to catch drippings, if any. ווא שולי זאת יופי של רשומה!! מאז שאבא שלי נהרג אני לא נוגעת בענבים אבל זה רעיון נהדררררררררר להכין ריבת ענבים שאני אישית מאד מאד אוהבת!! תודה וויני. יש איזשהוא קשר? :( כתבי על זה. Gorgeous color and such a beautiful tart. You did a wonderful job. I have to say grape jelly was never my favorite-I'm more inclined to have strawberry or even orange marmalade. But your jelly looks so tempting! I tried to make Concord jam this year but I cooked it too long and it was like a block! After seeing your amazing results and ethereal tart I need to give it another try! Let me know when you make it again, Deb & thx so much. Gorgeous looking tart. I've never had a grape tart before and your version is simply stunning. I need to try this one out, it looks so good. Thx Asha. believe it or not I haven't either. :) I just thought it would be a great combination. Shulie, your photographs are to die for! You are definitely giving Andrew some competition ;-) I am happy our words of encouragement were all you needed to make this amazing tart. Concord grape jelly was all I would eat with my peanut butter sandwiches when I was a kid. Living on the West Coast I've never cooked with the grapes, but now you have my mouth watering!!! GREAT JOB! TY sweet Jane & heehee about the AS comment. Thx for sharing about your fave P&J sandwich. I know what you mean about cooking grapes. We don't either much in Israel. That jelly and tart looks gorgeous! Such a bright and beautiful color. Love it! TY Asmita, I know, right?! Something about this variety of grape. TY Lisa. Means a lot. I agree completely on the virtues of homemade grape jelly. Fabulous tart! TY Viviane. You are always so eloquent and elegant! I have a feeling your grape jelly is SO much better than the brand name stuff of my childhood. And then you go and make a spectacular tart! I think you've definitely mastered pie crust...it looks divine! TY my friend, Liz. A great compliment coming from you. I can make you a new tart, Pamela. I still have 1 9oz Concord grape jar in the fridge. Oh Shulie. I wish I had this recipe when my grapes were at their peak. My jam turned into what might be called candy. It was thick like jelly when I poured it into the jars. I didn't know it still needed to be thin. And I am so wanting this tart now. I am pinning this for next year. Live and learn! Oh so lucky to have your own Concord grape vines, Abbe. Seriously I wish I could share with you a slice or two. 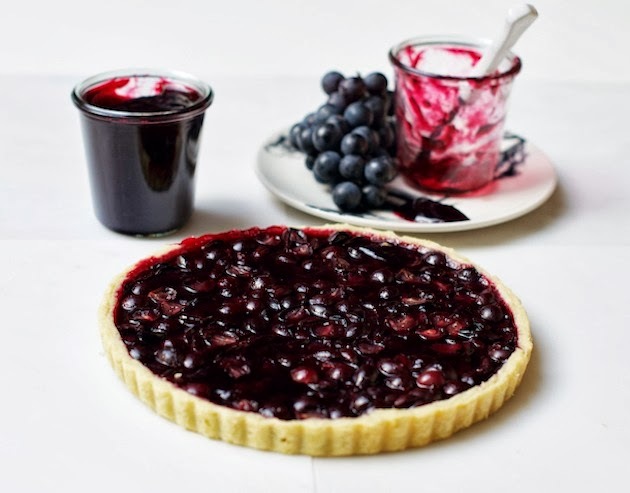 Gorgeous tart and that jelly - such a striking color! Both the pie and the jelly look sensational Shulie. Homemade jellies are infinitely better than commercial ones, and the flavor! Thanks for this easy recipe. About the pie crusts, they can vary for so many reasons, no two times are the same. Thanks Paula & so true about the pie crusts. I am trying this on the weekend because I just got about three pounds of concord grapes and have no idea what to do with them other than munching on them :) Will let you know how it turns out! Marie Angelique, You would love it. Read the little tricks here. Pan size, bubble intensity, etc. play a role here. If you have bigger surface pan it will be ready quicker. Let me know how it turns out. :) SO good on toasted multi grain, multi seed.